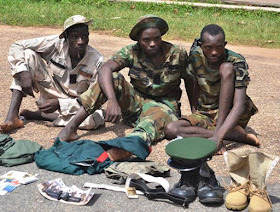 The Special Anti-Robbery Squad of the Oyo State Police Command has arrested a lance corporal with the Nigerian Navy, Jimoh Adesoye, 28, twin brothers, and 12 other suspects for robbery and receiving stolen goods. While parading the suspects, the state Commissioner of Police, Abiodun Odude, said the naval rating used his uniform and position to transport vehicles snatched by the criminal gang to buyers. The commissioner said their arrest led to the arrest of other members of the gang at various locations in the state. The alleged members of the gang, according to the police, are: Lateef Isa, 25; Taiwo Yekini, 23; Kehinde Yekini, 23; Tunji Ismail, 23; Adeyemo Babajide 23; Saka Jamiu, 20; Akin Akingbade 35; Mudashiru Abdullahi, 29; Rasheed Adeniran, 26; Lukman Jimoh, 35; Dauda Lamidi, 24; and Waheed Ganiyu, 30. Among exhibits recovered from the gang were one pump-action rifle, seven live cartridges, four cars, motorcycles and stolen home appliances. The naval officer said a friend introduced him to the gang while begging the police to forgive him. He said, “I am a seaman in the Nigerian Navy. I told one of my friends that I needed a car and he introduced me to these people. Although I have my personal car that I use, I wanted to change it and my friend introduced me to them. 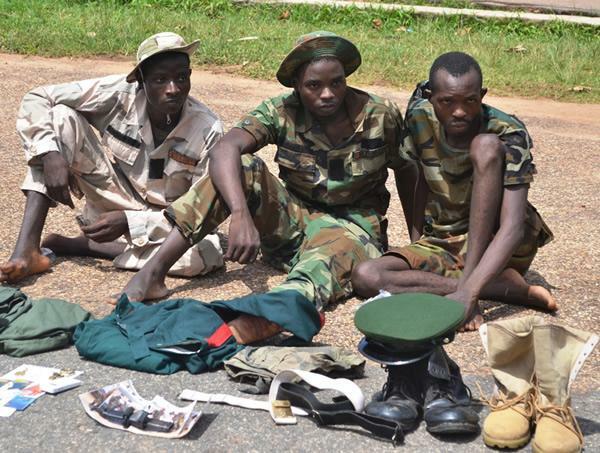 Also paraded were a soldier, Azeez Olaide, 22; and a former soldier, Ibrahim Lawal, 22; for their involvement with a criminal gang that specialised in kidnapping and r*ping their female victims. Odude, said Olaide was a member of the 202 battalion, Bama, Maiduguri, while Lawal deserted the Nigerian Army Depot, Zaria in 2014. Also arrested with the pair was one Kehinde Adeniji, 29. Odude said, “The modus operandi of the suspects was to go about kidnapping people, robbing them and s*xually abusing female victims.